Dec. 7, 2014: Hartford, Conn. 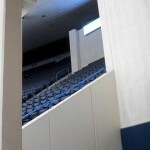 This was my first visit to what I knew as the Hartford Civic Center for 22 years. It was disheartening. The last time I was there it was because I made a point of seeing a Hartford Whalers game on a trip home. The team had five more years left before nefarious manipulations ended its Hartford run, but I already had a sense that the team’s future was precarious. About my relationship with the Whalers: it’s complicated. Always have been a Buffalo Sabres fan, and will be as long as they remain there. But I moved to Connecticut before fifth grade, and my life as a hockey fan became entwined with the Mighty Whale, from games at the Civic Center (many, but not all, against the Sabres) to “Hockey Night in Hartford” on Channel 30. I’m not looking it up, but in all the years, the Whalers and Sabres shared the five-team Adams Division, which had four playoff spots, I don’t think they both made the postseason in the same year. So it was pretty easy to adopt the Whalers as my second team, enjoying their triumphant, parade-worthy run to the second round (I attended game three in Hartford) in 1986, (damn you Claude Lemieux) and their division championship the next year as the Sabres were busy, um, rebuilding. Anyway, to me the Civic Center scene meant buzzing crowds, big-time players, and games that meant something. It had atmosphere. 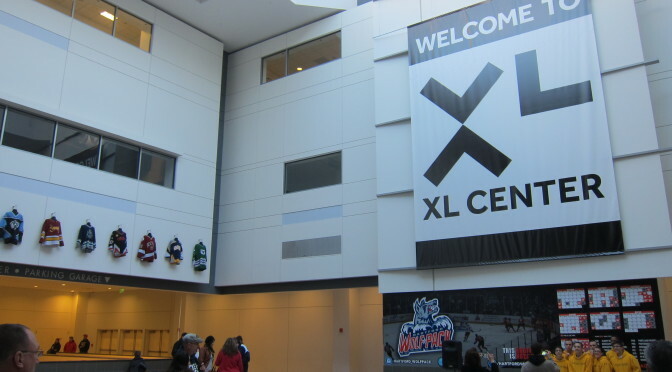 Everything that was lacking at what is now known as the XL Center. A small gathering at the former Civic Center. The arena is visibly the same. And in all honesty, the quality of the AHL game wasn’t bad. But the whole experience was as flat as a four-day old cup of soda. There was a group of rowdy fans that chanted semi-obscenely behind one of the goals. They tried. There was all kinds of the blaring loud music Kevin Dupont refers to as audioporn blaring from the P.A. system. But it echoed off the sea of empty seats. Many more empty seats are hidden behind the curtains. 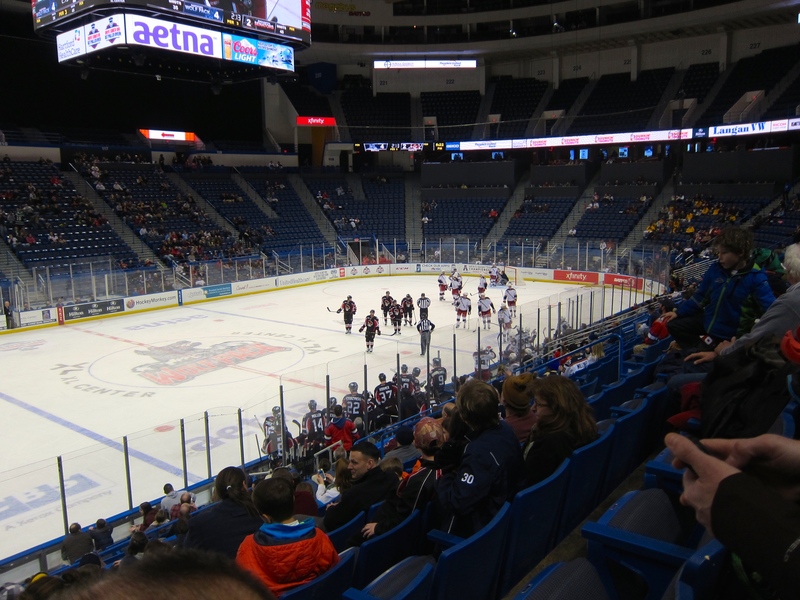 There’s a big problem with AHL hockey. The team isn’t really set up to win. Winning’s nice, no one complains, but the team exists to serve the needs of the big-league team, and if those needs weaken the AHL team, so what? 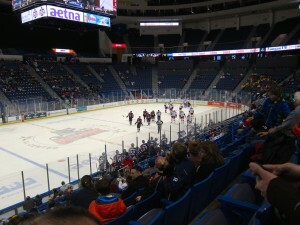 Even if I lived in Connecticut I don’t think I’d ever attend another Wolf Pack game. I doubt the NHL will return. The league doesn’t have that much class and good sense. But there is a silver lining for Connecticut hockey fans. There are three Division I teams in the state. Two of them met in the 2013 NCAA final. The third, UConn, joined the powerhouse Hockey East conference this year. Given the deep support for UConn sports in the Nutmeg state, I won’t be surprised if the halls of the former Hartford Civic Center buzz and its rafters rattle with cheers from fans watching high-level hockey that counts for something. Worth Every Penny: Thanks to the Boy Scout leader who offered their extra tickets to me and others standing in line. Henrik Tallinder, top, wearing #7, staring down the prospect of retirement. Bloodlines: The Wolf Pack dressed two Bourque brothers and a Vaive, all sons of well-known NHLers. Where Have You Gone, Hank Tallinder? 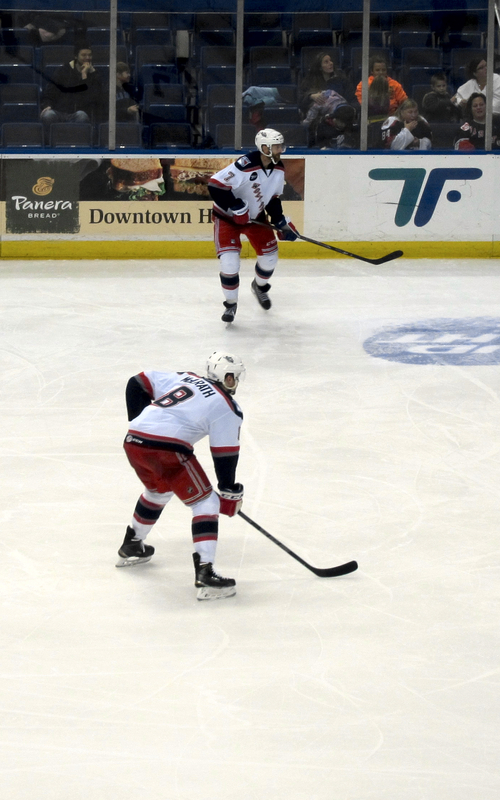 To Hartford, where the former Sabre was playing on a professional tryout deal. He looked like a steadying influence on defense, but the Wolf Pack cut him loose a week later. Game Report: Here and here.